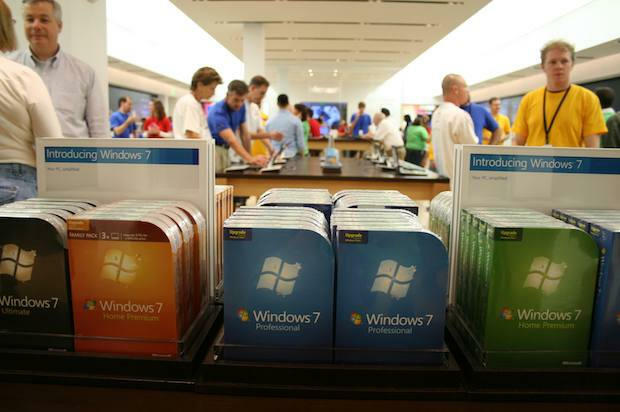 SCOTTSDALE, Ariz. — On opening night, Microsoft’s first retail store here drew lots more visitors than the long-established Apple store right down the street. 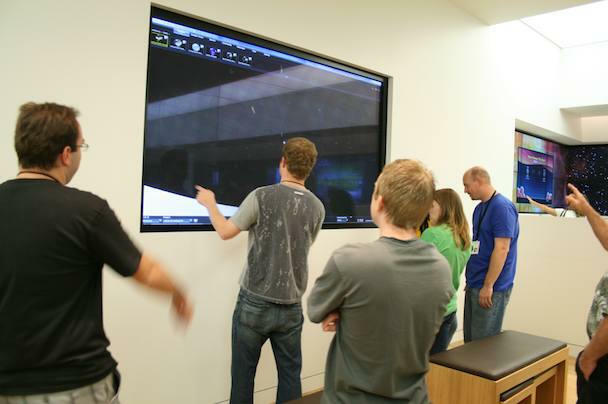 Microsoft’s store might be a plank-for-plank remake of Apple’s groundbreaking shops, but it’s got one thing Apple’s stores lack — walls of Xboxes. 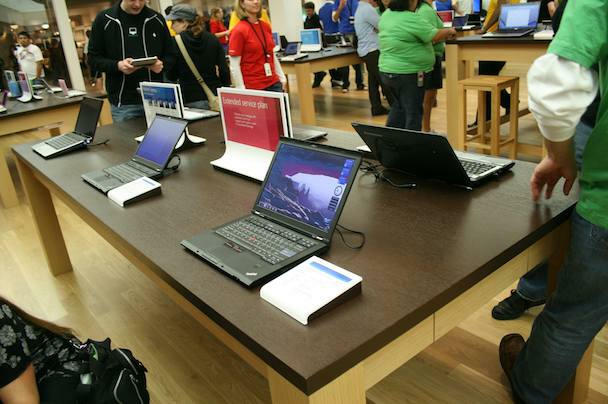 Hit the jump for more retina-burning retail pix, Microsoft-style. The first thing that hits you as you enter the store is the wave of happy-happy, joy-joy enthusiasm and color. The sales staff is very friendly. Extremely friendly. 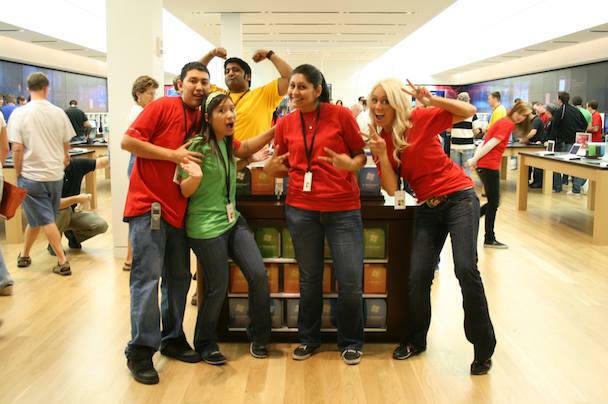 The deliriously delightful staff at Microsoft's first retail store. The crowd visiting the store seemed a little less tech-savvy and certainly less metrosexual than Apple’s jet-setting, urbanite shoppers. This is Scottsdale, Arizona — a swank suburb of Phoenix — so the crowd is more soccer-mom, a little little less hip. I actually fit in quite nicely. A visitor asked me what the Flip HD vidcam I was playing with was. Not a question I’d expect in an Apple Store. But that goes for the army of brightly-colored store employees too. One extremely cheerful Microsftee tried to sell me on the fact that there are more Zune apps available than iPhone apps. “Er, what?” I thought. Fortunately, another employee, who identified himself as a “Zune genius,” set her straight: there are only 12 apps currently available for the Zune. The money-taking area — ahem, cashwrap, in retail parlance — is even more minimal than an Apple Store's. No, the red shirts don't signify security, and the yelllow-topped employees aren't part of the Federation's engineering team. I asked. Decor-wise, the store seems to be carbon-copy remake of an Apple Store. 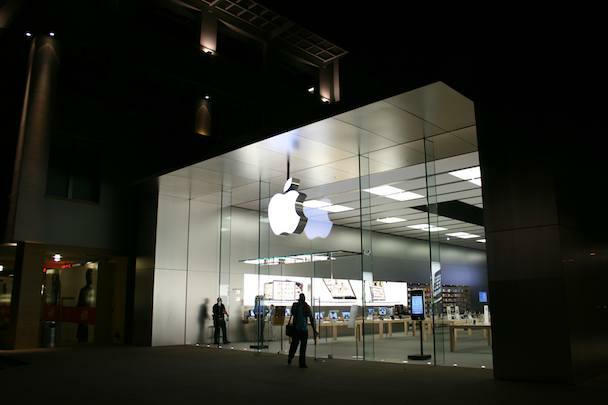 Not only that, but an employee confirmed that some of the employees were drafted from Apple Stores. 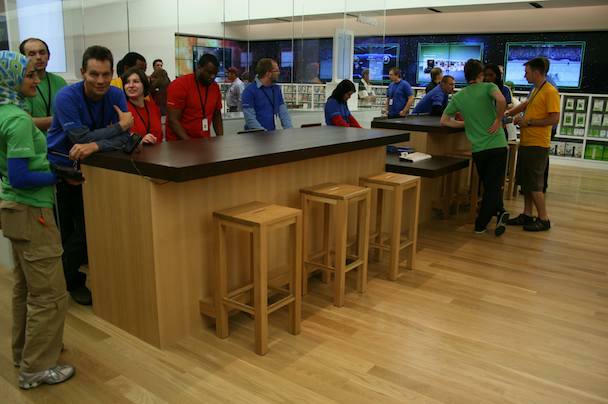 Daring Fireball even posted two videos showing that a manager at the Scottsdale Microsoft Store was once an Apple employee — seen peddling iPod Nanos to Bono and Oprah in a YouTube video — at the Chicago Apple Store. The store seemed smaller, but that could be just because it was jam-packed with employees, product, people, employees and product. And employees. Squint just a little and you're looking at some MBPs in an Apple Store. One really big difference over the Apple Store is the abundance of stuff to do at the Microsoft store. 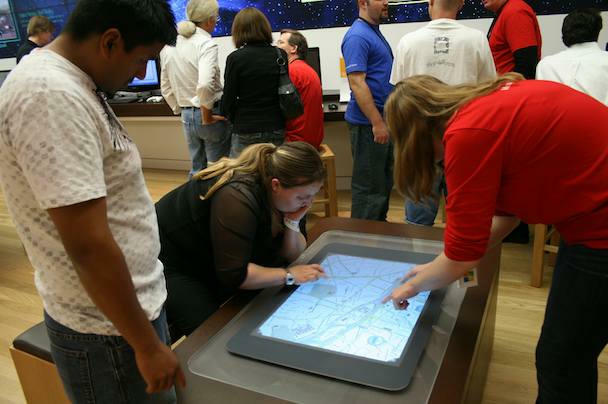 Four of Microsoft’s $15,000, touchscreen “Surface” tables are dotted around the store. In the back is a massive touch wall-screen and a pair of Guitar Hero Xbox setups. 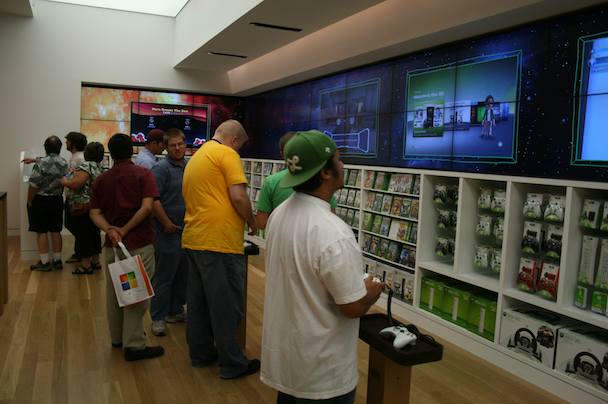 There are several Xboxes installed along one side of the store — their screens projected onto the walls. 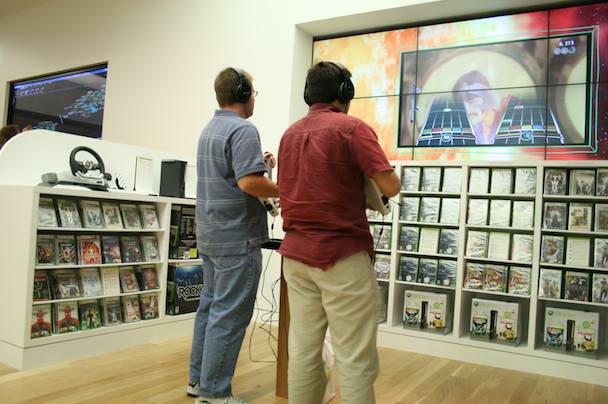 Something the Apple Store lacks: heavy gaming impact. And here’s the relatively quiet Apple store, which is just a few miles doen the road. Obviously, it’s not opening night at the Apple store, but you gotta wonder about the attraction of a hot game console. One of four $15,000 Microsoft Surface tables in the store. This really cool, massive touch-screen at the back of the store is somewhat hidden by poor store layout. The Guitar-Hero area at the back of the store was in constant use.